Embraer has chosen Pratt & Whitney's PurePower Geared Turbofan to power the next generation of E-Jets, the companies announced Tuesday afternoon. Hoping to officially launch what it calls generically its second-generation E-Jets “later this year,” in time for expected service entry in 2018, Embraer reached a conclusion about its engine choice after a years-long analysis of Pratt & Whitney’s offering. The new engines scheduled for introduction on the E-Jets—dubbed the PW1700G and PW1900G—cover a thrust range from 15,000 to 22,000 pounds. Embraer expects the new engines to generate a “double digit” improvement in fuel burn, maintenance costs, emissions and noise. Plans call for the new airplanes—known colloquially as the G2 series—to also use new wings, full fly-by-wire flight controls, and other new or modified systems. 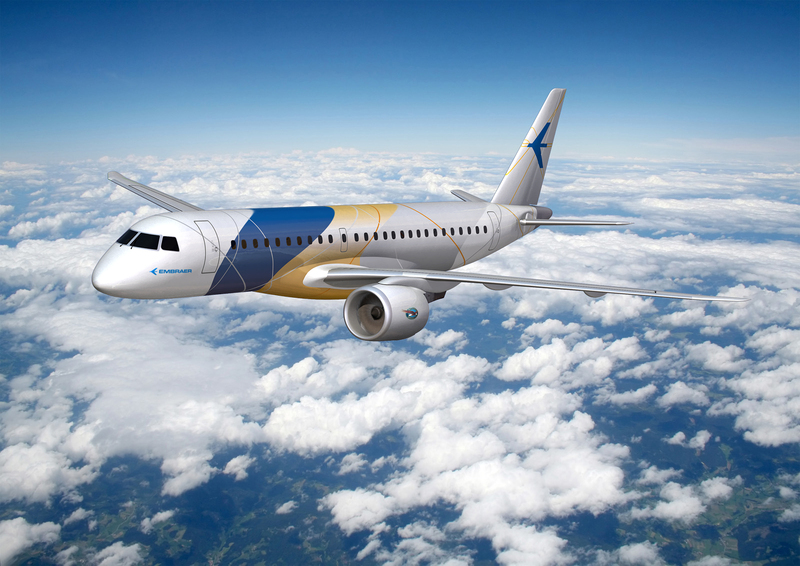 Although a completely new design, the larger wings destined for the new airplane will remain most metallic, Embraer commercial aircraft president Paulo Cesar de Souza e Silva explained to AIN on the day of the announcement. Other new systems will likely include the avionics, although Silva said Embraer has yet to assign any other new suppliers to the project. It does know it will need to increase the size of the landing gear in the E190/195 due to the fact that the PW1900G’s fan diameter will measure 20 inches wider than the 53-inch CF34-10Es now used in the airplanes. According to Pratt & Whitney vice president of new-generation products Bob Saia, the architecture of the PW1900G will closely resemble that of the engine designed for the Bombardier C Series—the PW1524G, while the drawings of the PW1700G, whose fan would measure 56 inches in diameter, reflect the architectural features of the engine used on the Mitsubishi MRJ—the PW1217G. Embraer still does not know for certain, however, whether or not it will offer the E170—the smallest of the four variants now available—as part of the new family, according to Silva. Saia added that the choice of the eventual launch customer will determine which engine goes to test first. The second-generation E-Jets join future aircraft under development by Bombardier, Mitsubishi, Airbus and Russia’s Irkut as platforms for the new PW1000 engines. Following the PW1000’s commercial launch on the Mitsubishi MRJ in 2007, it took several more years of testing before Pratt earned the confidence of Embraer CEO Frederico Curado, who originally expressed skepticism about the basic concept. More recent comments from Curado reflected a less pessimistic view, however, as the company embarked on a detailed assessment of the GTF and its competitors—the CFM Leap-X and still orphaned development platform by Rolls-Royce now known as the E3E. Silva explained that the Pratt & Whitney product offering more closely matched what its customers wanted in terms of performance. He wouldn’t specify the exact amount of fuel burn improvement expected, however, nor would he commit to any new range estimates. The size of the new airplanes, while still under study, will likely not deviate much from the current generation, he added.